What they deliver are skillful personalized cuts and customized color, tailored to their clients’ facial features, skin tone, hair texture, lifestyle, and personal aesthetic. No two clients are alike, and neither is their hair. The style team can smooth the frizziest curls, add thickness and body to thinning hair, and create bounce where limp locks once existed. Expertly placed color can transform your look from drab to glowing, and whether it’s subtle or dramatic change you’re looking for, you’ll simply radiate. Bring them the hair you have, and you’ll leave with the hair you’ve always coveted. The skin is the largest organ on our bodies, and seeing marked improvements in skin tone, texture, firmness, and smoothness just feels wonderful – inside and out. 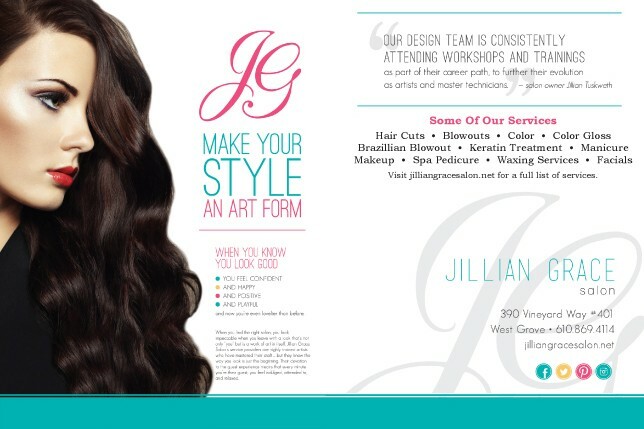 Jillian Grace’s estheticians are licensed specialists in dermal biology and physiology. “Their passion is to solve even the most troublesome skin concerns, and make our guests love their skin like never before,” says Jillian. All facials are customized to address each guest’s unique skin needs. They use the Dermalogica® skin-care line, researched and developed by the International Dermal Institute, for optimal skin health and beauty. When art and science converge, you can elevate the way you look, and it sparks a jolt of confidence that sinks in and takes hold. Elevate the way you feel, and it radiates out of you. ← Previous Story A Foundation That Could Treat Your Acne? Next Story → CoolSculpting® Vs. SmartLipoTM Contest!